If you have any interest in snakes (or just think that snakes are cool since you watched the first Indiana Jones movie) then this will make for an interesting trip. Every weekday, they demonstrate at 11AM how to extract venom from a snake, and at 2:30 you can handle a snake. Don’t worry, you the snakes won’t use you to deposit their venom – the snakes that visitors are allowed to handle are all tame snakes. And even if you’d get bitten – fortunately, they have plenty of snake poison venom here 😉 So if you’re looking for a more thrilling Bangkok sightseeing experience, this might be a good choice for you – kids always love it. This is more an educational and research facility than a tourist entertainment establishment. For example, they also train members of the police how to catch snakes. (In Thailand snakes are very common. On a recent trip to visit her parents upcountry, they spotted a cobra in their rice field. If a person gets bitten by a cobra in such a remote place, it can end deadly, as snake venom is not readily available). So it makes sense that people receive training in how to catch snakes without getting bitten. A visit here is not just entertaining, but can also be really educating, because they will tell you stories and facts about the snakes and their life. You will learn about herpetology – and that has nothing to do with herpes, but it’s the study of reptiles and amphibians. (Although SNAKEOLOGY would surely sound more awesome). For example – snakes are completely deaf. They just can’t hear sounds. However – they can pick up vibrations with their jawbones. Another interesting fact about snakes is that some of them can even swallow a tiger. A whole tiger that is! Snakes can swallow animals that are three times as large as their own mouth, because of special tendons in their mouth. 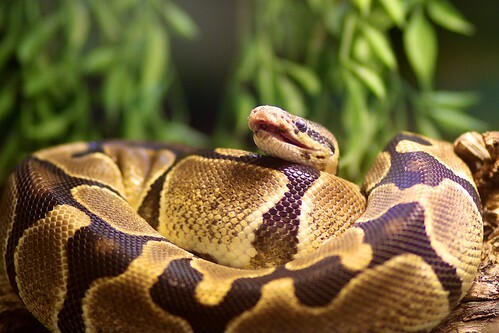 There are around 3000 kinds of snakes in the world, but less than 400 of them are venomous. And in Thailand, especially upcountry, snakes are sometimes eaten. The snake farm is a rather old institution. It was founded in 1929. Several members of the royal family founded the Simaseng Fund (The Four Snakes Fund) and donated their own money into it, to support the Red Cross Society of Siam. Their donations also paid for the construction costs of the Simaseng building where venomous snakes and other poisonous animals are kept for biological and medical research purposes and for public education. You can also be sure that the snakes here aren’t abused, drugged and tortured. The Bangkok snake farm at the Queen Saovabha Memorial Institute is associated with the Thai Red Cross Society and they take good care of the animals. Every year around 40000 visitors come to watch the snake shows here, and there are often also international filmmakers that shoot documentaries here.